Clerk’s log, MJDate 54262.0: Scott’s gracious comment on a previous article reminded me of something remarkable that happened this past February. Let me tell you about it. Wow. I began listening to Strauss’s music with a fascination I’d never had before, because Stanley Kubrick and company had built a bridge for me to this unknown territory. It happened again on the fourth of February twenty-aught-seven. Scott Sigler — King of the Hard-Science Monsters — the man who single-handedly ensured that thousands of listeners would never again look at a pair of poultry shears without a certain shudder — had been podcasting his marvelous Galactic Football League novel The Rookie (billed as “ Star Wars meets Any Given Sunday meets The Godfather ”), about a minor-league — excuse me, -tier — quarterback suddenly thrust into the interstellar big time, with competition to match. I came to the novel after having lived for ten years in Dallas. Football in Dallas is less a pastime than a religion, and I had little time for it. Sheer barbarism, I would declare, in which people with obscenely more money than brains1 spent hours smashing each other into early dementia. I would watch the Super Bowl, but only for (a) the companionship of friends and (b) a peek at what advertisers had come up with for the new year. The game itself was wasted on me. As Sigler chronicled the trials and maturation of the Ionath Krakens’ rookie player Quentin Barnes, two things became inescapably clear. One is that Sigler passionately loves the game of football (American football, that is, although he enjoys soccer as well) — and let me tell you, there’s no better introduction to a sport than from a true amateur (in the literal sense). The other is that, although the brutality was no less real, I had to put my “little or no brains” images aside. The stereotype of the dumb-jock quarterback, despite the sour grapes with which high-school nerds like me reassured ourselves, is balderdash. Sigler makes this point explicitly, and it wasn’t lost on me. Football, as he presents it, is not so much Zombie Demolition Derby as Harry Potter and the Sorceror’s Stone ’s2 animated chess game on amphetamines. Strategy and tactics are all-important, and those tactics must take into account each and every opposing player — not just as a position but as an individual, with individual talents and skills. The tactics can change at any time, so that the tactician is (figuratively as well as literally) trying to hit a moving target. The quarterback must be able to read everyone’s present and probable future position (“Dr. Heisenberg, please call your office”), which also can change in an eyeblink; what’s more, his fellow players must be able to see and move with the changes also, to optimize his chances of making a successful pass or run. On top of that, all this on-the-fly planning must take place within split seconds, as the opposing linemen try to break through the defense and turn the quarterback into oatmeal and strawberry jam. February 4 came, and with it the Indianapolis-vs.-Chicago Super Bowl. My wife and I watched it together (no available gathering of friends this time), and something amazing happened. I saw strategy and tactics. Individual players with their unique sets of skills. Hair-trigger decision-making. Super Bowl XLI came alive for me. Along with every football game I’ve watched thereafter. Thanks, Scott. As if telling an exciting story weren’t enough (it is indeed a nail-biter — galvanized framing nails, of course — and, as a bonus, has some of the most gut-busting, laugh-out-loud moments I’ve experienced during a Sigler novel), this was an accomplishment. My hat is off to you, sir. Now if they can just do something about all that smashing …. This entry was posted in General, Podcasting, SFF: Writings. Bookmark the permalink. Wow, you have totally made my day. What a fantastic feeling to know that I’ve conveyed the complexity of the game, and the intelligence required to play it. Far too many science nerds (like me) think that it’s the realm of “dumb jocks,” but that simply isn’t true. There are different types of intelligence, and the ability to make those kind of calculations on the fly (while people are trying to physically destroy you) is quite rare and denotes a special kind of brain. I’m thrilled you enjoyed the SuperBowl, and here’s to wishing you many more enjoyable hours as you peek in on the game’s progress. Thank you! And you want to know what’s especially weird about all this? I’m normally the sudoku type. There’s another measure of your achievement. 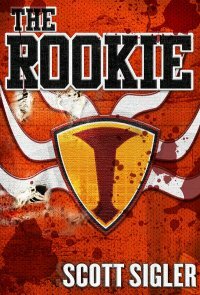 Incidentally, it casts an interesting light on the fact that the protagonist of your Infected is an ex-linebacker. This is no mere muscle-guy the critters have latched onto. You just know there’s going to be a battle.